Let there be light. 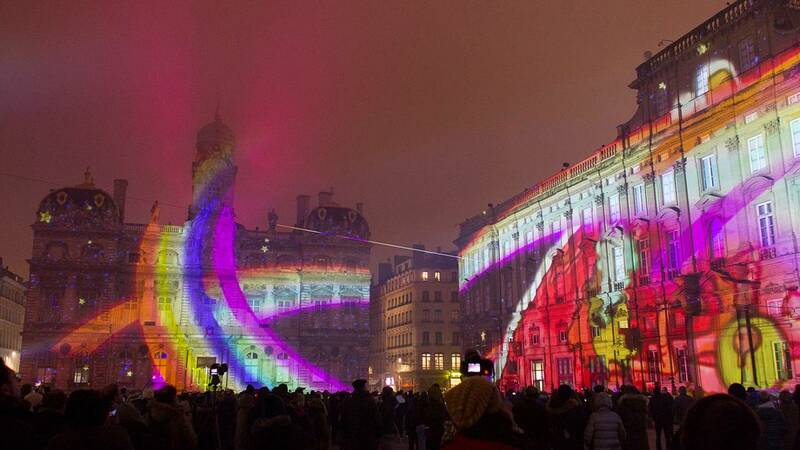 It is the “Fête des Lumières” in France’s second city – Lyon. Last year’s annual stunning spectacle was cancelled in the wake of the Paris atrocities. Now the lights are back on though the festival has been shortened and being held under tight security. The lights sparkled within a security perimeter policed by 750 armed personnel. The city has laid on 41 exhibitions almost half the number of previous years in the historic heart of the city. “It is a smaller creative spectacle than usual. And we hope the audience will enjoy being in these areas which are actually completely secure,” explained Jean-Francois Zurawik, Head of Cultural Events, City of Lyon . Projecting light on the majestic facade of the Cathédrale Saint-Jean is a challenge for any light artist. This year Yann Nguema with his group EZ3kiel were chosen to construct or let’s say reconstruct the historic monument, virtually, stone by stone. “The idea is to play with the stones, not with the volume like most other artists, who map them. There is a big phase of drawing, we have drawn all the stones and there are 12000 to draw. ‘Then I find scenarios to put movement in the lines of each stone, and so it falls, flies, swells, deflates, it is a game with the laws of physics,” the artist explained. One of this year’s highlights: “Incandescens”, is a story about fire and light , projected onto the steps of the old Roman theatre on Fourvière hill. “We wanted to work on the theme of the theatre in shadow. It made sense to work also with flame, which was the first source of light that could have been here in this place. And we have created a story about these two characters who will meet each other. The flame will drag the girl into different worlds,” explained Simon Milleret-Godet. “Platonium” inside the courtyard of the Hotel de Ville is an artistic co-production with the French National Centre for Scientific Research in a unique approach to make sense of science. “The tissue that is woven of optical fiber is really the ribbon that is used in the laboratory of the French National Centre for Scientific Research the CNRS to analyse autocatalyst phenomena. That’s to say a way of cleaning up water and air using air and certain chemical particles,” explained Akari-Lisa Ishil. A perfect spot for those searching for the love of their life was “Coups de cœur” a giant heart, measuring the pulse of those who dare to put their fingers on the console. Than they hear a famous tune corresponding to their heart beat. “So we have two discs with cardiac rhythm sensors that are available to you. So with them we’re going to try to measure the heart beats of the couple. You have to be a philosopher, because there is something for everyone,” said Franck Pelletier. This year’s event, which kicked off on Thursday, runs for three nights instead of the usual four and the hours have been shortened too. But that does not appear to be dampening spirits. “Its beautiful, yeah, its really nice,” concluded one visitor from Italy.